This is Part 3 of our Introduction to Lean Manufacturing Principles Series. Kaizen is daily, so truly continuous. We don’t have to stop everything and have a special Kaizen Event for it to work, although we may also choose to do so. Kaizen is practiced by everyone from the CEO on down to the janitors without exception. It is all about participation and it cuts across hierarchies in ways that can greatly improve morale in the workplace. As the Wiki says, when properly practiced, it can be nurturing and can foster a strong sense of teamwork. In typical Japanese companies such as Toyota or Canon, each employee contributes 60-70 suggestions a year. 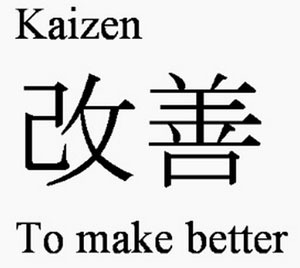 Kaizen teaches people the importance of and how to think about eliminating waste in all kinds of business processes. Kaizen-derived changes are typically small refinements rather than big sweeping changes. Because they’re small, they’re usually very inexpensive and easy to adopt. But, taken together over time, they can make a big contribution to productivity. A common term for “suggestion” in Kaizen is “OI” which stands for “Opportunity for Improvement”. Which Organizations Will Succeed With Kaizen? – There is always room for improvement and improvement is valuable. Complacency and a view of, “If it ain’t broken don’t fix it,” will resist Kaizen. – Workers feel confident about making suggestions. Workers need to feel their opinion is valued. Kaizen creates a framework that fosters that atmosphere by having workers suggest real improvements that are acted on quickly. – Everyone’s opinion is valued and considered. Kaizen is egalitarian. Everyone is in a position to see something and make a potentially valuable suggestion. Excessively hierarchical organizations where workers are afraid to bring anything up with the boss will have a harder time with Kaizen. – Strong personal discipline. Kaizen is serious important work. In order to succeed, people can never regard suggestions as criticism. Every suggestion stands on its own and must be considered without regard to either who made the suggestion or who it affects. – Teamwork. The most successful Kaizen implementations happen with organizations that have a strong sense of teamwork. It’s important for organizations to know what sort of culture can thrive on Kaizen, and which cultures make Kaizen difficult. If you have a difficult culture, you need to decide whether Kaizen is for you and whether you’re willing to overcome and change your culture. Fortunately, Kaizen can be as much about cultural change as it is about the specific changes being recommended. Successful Kaizen launches require management to lead by example and get the staff interesting in participating as much as possible. That means that if management isn’t ready to lead by example, Kaizen will not get off the ground and stay engaged. Employee training and communication is also critical. Management has to show by taking their time to work directly with employees on the Shop Floor how important the Kaizen program is. Take at least a week at the start, be on the Shop Floor every day, and help employees to develop their suggestions. Be sure to be encouraging at every step. Any participation, even if ideas are not adopted, is far better than no participation. As much as possible see that suggestions are acted on immediately and follow up to see how they’re working out. Never allow suggestions to just disappear into the management “black hole.” If a suggestion cannot be acted on, be sure to explain why. Understanding why not can help employees to understand the business better in order to make better suggestions going forward. Above all, never let things become adversarial or overly competitive. The spirit of Kaizen should be positive. A great way to encourage submission of ideas is to evaluate supervisors on how many suggestions the people they surpervise have made. Don’t evaluate the employees, make it the supervisor’s job to create an atmosphere that encourages submission. Also, nothing encourages like action. Seeing an idea go from thought to implementation is a big motivator. Managers can further stimulate Kaizen by creating Kaizen Events that are focused on improving some particular area. Organized Kaizen can be practiced on a weekly basis using what is called a Kaizen Blitz or Kaizen Event. Assign a particular team with no more than 10 or 15 people on it to participate. Rotate participation around the shop with each event. Also rotate who will lead the Kaizen Team. It is the Kaizen Team Leader’s reponsibility to choose the team. Choose a central focus for your Kaizen Blitz. Blitz’s are focused on reducing waste by going after throughput (how can we perform this process more quickly or get more output from it? ), inventory (how can we perform this process with less inventory, where inventory can be inputs, outputs, or work in process for the process), or cost (how can we perform this process at a lower cost, where cost may not be monetary but could be time, effort, or wasted materials as well). Before the Kaizen Event can proceed, there must be data available of the waste we’re trying to reduce. Collect the data before initiating the Kaizen Event, prefarably as much as a month before, and ensure there is some history on the data and you’re not looking at just one set of hastily gathered data points. Learning how to collect good data is another Kaizen skill. While team-based brainstorming is great, and beats no Kaizen at all, giving that same team real data to process is even more powerful because data eliminates uncertainty in decision making and analysis. Teams that rely exclusively on “gut feel” or incomplete and anecdotal data are extremely likely to make bad decisions. Be sure to follow up any changes with continued data collection and a follow-up session down the road before to long that checks to see whether the change is working. Many organizations believe data gathering is costly and contrary to the Kaizen culture of making speedy decisions. Gathering data will save time and result in more accurate decisions, which saves still more time in the long-run. It is the responsibility of the Kaizen Team Leader to make sure there is sufficient data available for the team to do its work. If there isn’t, the event should be postponed while the data is gathered by team members. The Team Leader should prepare a schedule for what the group is expected to accomplish each day before the event begins. That schedule should be shared with management so they understand the resource requirements for the event and can provide their suggestions and input as well. It’s not necessary for the entire day to be used up for each team member. Ideally, the Team Leader should present to management at the conclusion of each day what the Team accomplished and what findings, if any, they made. Day 1: Document Current State. Get the whole team on the same page about the current state of the activity or process the Team is tasked with improving. The meetings opens with a description of the charter of the event and presentation of the schedule so the Team knows what’s expected of them. The responsibilities of each individual team member are also covered. The Team should spend time observing the process together to ensure shared familiarity and to offer a chance to ask questions together. A good first step after observing the process is to create the first draft of a Value Stream Map (see below). Day 2: Evaluate the Current State. Evaluation means to quantify the impact of waste, identify and prioritize any bottlenecks, update your Value Stream Map, and start to analyze the root causes of the waste. It’s important to focus as much as possible on real data and not on opinion. Any opinions should be validated by referring back to the data. Day 3: Characterize Solutions and Plan their Implementation. By the end of Day2, the Team should have a thorough understanding of the problems they’re trying to solve, so it’s time to brainstorm solutions and plan their implementation. The Team needs to identify and plan for both immediate changes and future changes. If possible, begin implementing some of the changes on this day. Day 4: Implement Changes. The goal Day 4 is to implement as many of the immediate changes as possible while disrupting the workplace as little as possible. That can mean any number of things including application of 5S principles to cover any rearrangement of equipment or tools, updating work documentation, training workers in the new changes, and so on. On this day, the new changes are being piloted for the first time. As much as possible, the Team should try understand whether the changes are meeting their goals. Day 5: Launch the New Process from Pilot to Production and Debrief. Assuming the bugs are worked out, launch the new process into production and prepare a report based on the results you’ve achieved. Nail down any final approvals and documentation you may need. Make sure your report summarizes what improvements were achieved and how they were measured. Put a process into place that will revisit and monitor the new process on a weekly basis for 4 weeks or so to ensure that all is well and productive. Kaizen events can be shorter–2 day events are also very common. They can be longer too, but the latter is not a common practice as the emphasize is on rapid decision making and improvements. Clearly, events like the one described are intensive activities. Your organization will not be doing them constantly in all likelihood as there is too much else to get done. That doesn’t mean you can’t continue to benefit from Kaizen even when there’s not a full scale Kaizen Blitz going on. After all, Kaizen is a process of daily continuous improvement. 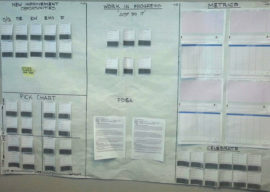 A standard mechanism for gathering daily Kaizen inputs and suggestions is the Kaizen Board. The board has a place to submit new opportunities, an area for Work In Progress, an area for Metrics, and an area to “Celebrate” initiatives that have worked and are part of daily practice. Other interesting ideas include the “Pick Chart” which categorizes incoming ideas by Impact and Difficulty (presumably they have to go there before they can be chosen as Work in Progress) and the PDCA section. PDCA is cycle often used with Kaizen whose letters stand for Plan, Do, Check, Act. We’ll talk more about PDCA in a future installment of the series. – Schedule process tours: A calendar showing when different areas will be toured so folks can get familiar with the process and offer their ideas for improvement. – Hall of Fame and other Recognition features. 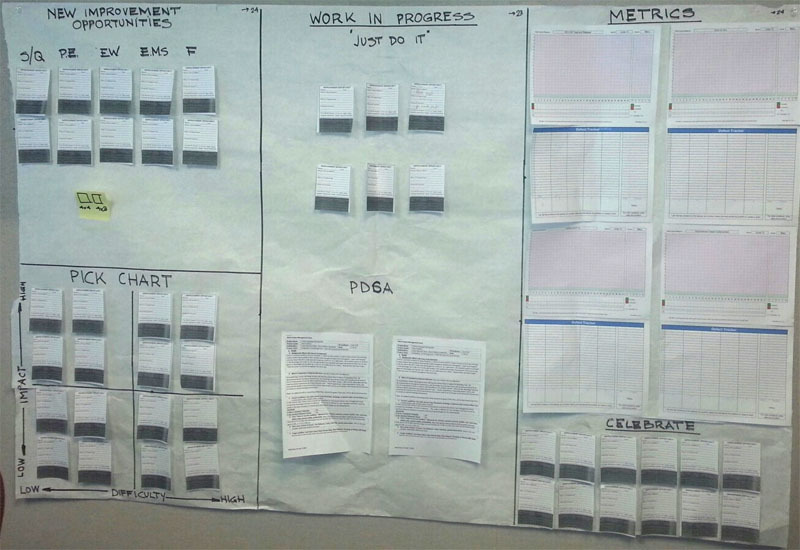 There are many more Kaizen Boards pictured on Google. They’re easy to create and Kaizen Boards are extremely useful tools, but organizations need to remember a Kaizen Board is not Kaizen. Again, culture, participation, and process are what Kaizen is really about. A Kaizen Board can make a Kaizen Culture function more easily, but it can’t create a Kaizen Culture where there was none before. 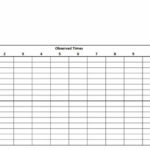 The next installment in our Lean Manufacturing Principles Series fills out the notion of “Value Stream Mapping”, which we mentioned is a good way to do the analysis portion of Kaizen. 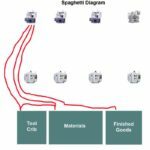 Be sure to check out Value Stream Mapping, Lean Manufacturing Principles Part 4.